Die Auflösung eines Objektivs ist beubungsbegrenzt von der Blende abhängig. In the picture you can see small sections (about 100 pixels wide) of a photograph that was taken with a 50mm lens from a distance of 5m from a laptop screen. We see significant uncertainty in the larger aperture numbers (22). The lower quality in Aperture 1.8 is due to other aberrations. Due to the diffraction limit the diameter of a pixel is d = 2.44 · λ · B, where F-number B and the wavelength λ determined. With a typical value of λ = 555nm we obtain d = B · 1.3μm. The typical pixel size of today’s digital SLR cameras is about 5μm, so that we reached at f / 4, the theoretical limit. Digital Cameras have in some cases significantly smaller pixel sizes because they work with smaller image sensors. This entry was posted in Bilder, Physik and tagged Fotografie, Optik on 24 November 2009 by DS. The 20 regular readers are probably a little tired of the polarization, but the big difference between horizontally and vertically polarized light at a normal view I was not aware of. The sun was low, and about 90 degrees to the left of the view direction. The sunlight is therefore scattered in the mist by approximately 90 degrees. In this case, the polarization can only be perpendicular to the direction of incidence and outgoing beam. Therefore in the picture it is almost vertically. Both images were taken with the same aperture and shutter speed. To get an idea of where polarized light appears in the picture, I have determined the difference with the GIMP. In the fine structures in the tree, the leaves probably did not stay exactly in the same place. The brightness at this positions are probably artifacts. In landscape photography you should always have a polarizing filter it. 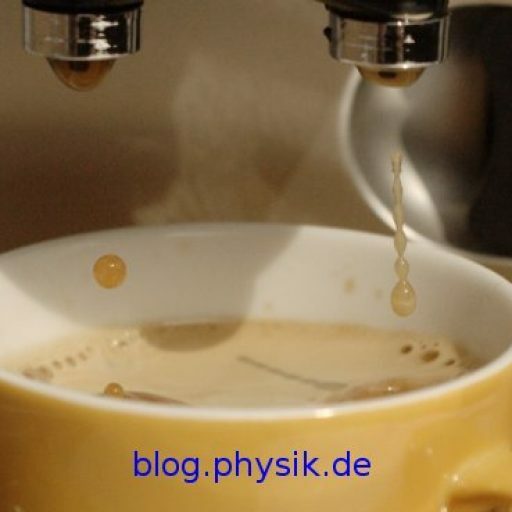 This entry was posted in Bilder, Physik and tagged Optik, Polarisation, Streuung on 14 October 2009 by DS. Polarisation of a LCD display'>linear polarisierten Licht des LCD Bildschirm gleich, wenn die Seite mit dem linearen Polarisationsfilter in Richtung des Bildschirms zeigt. Für einen 3D Effekt wären die Brillen so natürlich nicht geeignet, da hierbei jedes Auge ein anderes Bild “sehen” soll. Im nächsten Bild erzeugt die “falsch” herum gehaltene Brille am großen Pferd zirkular polarisiertes Licht, beide Gläser in unterschiedlicher Drehrichtung. Das Licht des unteren Brillenglases wird von der vorderen Brille blockiert, das des oberen Brillenglases durchgelassen. Die Brille wird im 3D Kino zirkular polarisiert verwendet. Used in the wrong direction the 3D eyeglasses blocks linear polarized light of the LCD display. Modern 3D eyeglasses consists of circular polarisation filters. These filters have on the one side a normal linear polarisation filter and on the other side a ?/4 plate. Therefore both glasses of the eyeglasses behave in linear polarized light LCD of the screen directly, if the side with the linear polarisation filter shows toward the screen. For a 3D effect the eyeglasses would not be suitable, since here each eye has to see another picture. In the next picture the eyeglasses held at the large horse produce circular polarized light, both glasses in different direction of rotation. The light of the lower eyeglass lens is blocked due to the front eyeglasses and let through that of the upper eyeglass lens. The glasses for 3D cinema use circular polaized light. This entry was posted in Bilder, Physik and tagged Optik, Polarisation on 1 October 2009 by DS.